While the settlement amount was perhaps astounding in that case, the biggest impact it has had on other firms and AMCs has stemmed from the trial court’s order on a summary judgment motion. Before we get to the significance of that order and whether commercial appraisers need to be paid overtime, let’s take a look at general federal overtime requirements as they apply to appraisers. Judge Carter’s order in the Landsafe case. There is no definitive appellate court guidance on whether real estate appraisers performing valuation work are properly treated as exempt employees. There is also little specific guidance from the federal Department of Labor, other than a fairly obscure single opinion letter. Thus, in considering whether appraisers must be paid overtime, what we are mostly left with for guidance are decisions at the trial court level, and Judge Carter’s order is the most prominent among such decisions. Appraisers do not exercise discretion with regards to matters of significance. Appraisers do not have the authority to formulate, affect, interpret, or implement management policies or operating practices; they do not carry out “major” assignments in conducting the operations of the business; they do not have the authority to commit the employer in matters that have significant financial impact; while Appraisers may have to consider issues beyond established guidelines, they generally do not have the authority to “waive” or “deviate from” established policies and procedures without prior approval; they do not have the authority to negotiate and bind the company on significant matters . . .
His published decision in the LandSafe case soon spawned about ten other class actions by residential appraisers against appraisal firms and AMCs, as well as some individual cases against small firms. 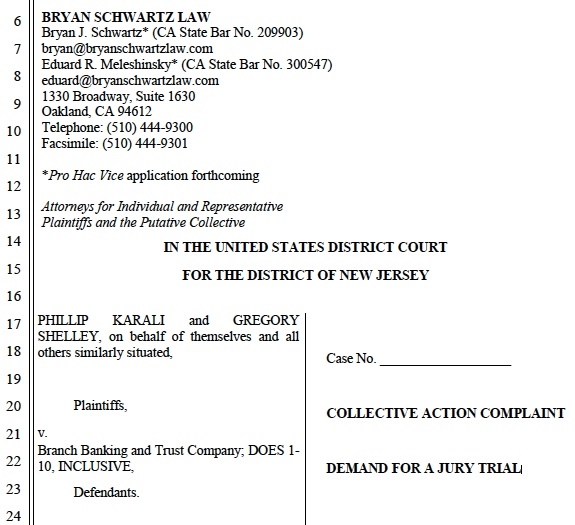 His decision is cited in nearly every such case. Now, the overtime issue is at the doorstep of employers of commercial appraisers. Must commercial appraisers be paid overtime? 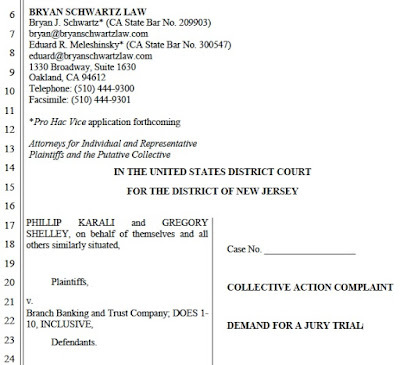 The question is teed up in a pending case entitled Karali v. Branch Banking and Trust Company in the U.S. District Court for the District of New Jersey. In this case, a conditionally certified class, led by an MAI certified general appraiser, is suing BB&T for unpaid overtime. The class actually consists of both “Appraisal Review Officers” who are mostly certified general appraisers employed primarily to review commercial real estate appraisals for BB&T and “Real Estate Evaluators” who perform evaluations and may be either appraisers or non-appraisers. And, it should be noted that the lead law firm on the plaintiffs’ side handled the $36 million case against LandSafe. Appraisers do not help run BB&T’s business. Appraisers do not typically have “managerial responsibilities.” . . . They do not supervise other employees, and have no authority to hire, fire, promote, or provide annual reviews to other employees. . . . Instead, Appraisers are subject to a high degree of supervision, including frequent staff meetings, one-on-one meetings with their managers, performance reviews, and close monitoring of their production, turnaround times, and quality by their managers and the QC Group. Most appraisal reviews performed by [Appraisal Review Officers] are on commercial properties, which are more complex than residential appraisals in that different and more varied appraisal techniques and methodologies are used; there is a greater knowledge and experience base needed for understanding these appraisal methodologies; and the types of commercial properties (i.e. convenience stores, multi-family homes, golf courses) and issues associated with those commercial properties are quite varied. It will likely be some months before the Court makes a ruling in the BB&T case, but the matter should be watched closely by firms, AMCs and lenders employing staff commercial appraisers. While the case most specifically relates to commercial review work, rather than performance of commercial appraisals themselves, it could have a big impact on the future direction of overtime litigation by commercial appraisers. If the ruling spawns more suits, however, it might be tough for appraisers to keep or grow respect for their profession, while suing more of the firms and banks that employ them for overtime and rest breaks — and denigrating their own work to win the cases.